The next round of auditions for new members at all choir levels will be held in June 2019. 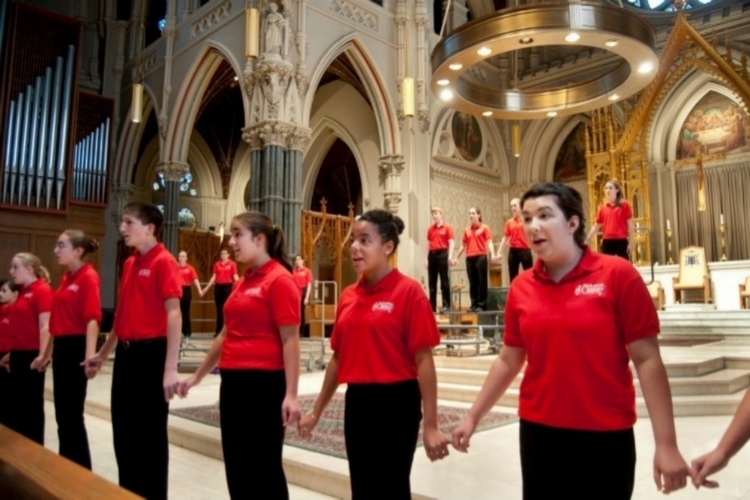 The RICC High School Honor Choir is an advanced mixed chorus (SATB) for high school students. Especially seeking tenors and basses who love to sing! Members of the RI Children's Chorus appeared in the film, MOONRISE KINGDOM (2012), starring Bruce Willis, Edward Norton and Bill Murray. Directed by Wes Anderson (pictured). The RI Children's Chorus performs at the MONOPOLY BALL to benefit Hasbro Children's Hospital. RI Convention Center - March, 2014. The RICC Chamber Chorus performs at the American Choral Directors Association conventions in Baltimore (2014), Providence (2012), and Philadelphia (2010). The RICC Training and Lyric Choirs perform the National Anthem for the Providence Bruins. February, 2013. The RICC Lyric and Training Choirs perform at the RI Convention Center for the 2014 New England Family Fun Fest.